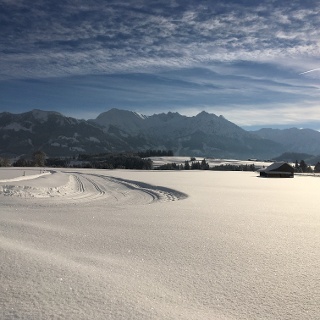 Short, easy beginners' round on the southern outskirt of Ofterschwang with a magnificent mountain view of the Allgäu Alps. 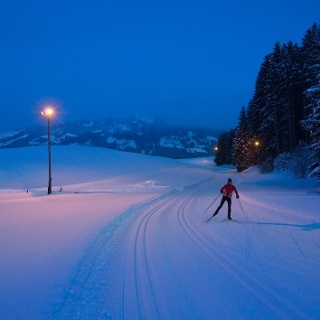 Use of the cross-country ski trail is free of charge. 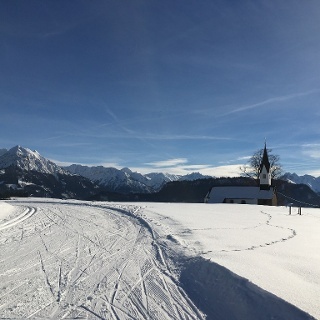 Short, easy beginner's round at the southern outskirt of Ofterschwang. Parking at the church in Ofterschwang (access via Moosweg), alternatively please use free parking at the valley station of the Weltcup-Express. 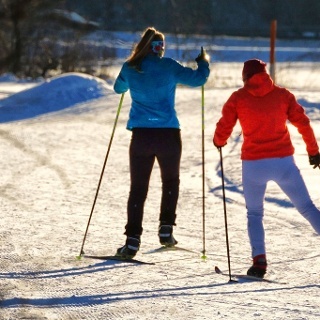 Use of the cross-country ski trail is free of charge. From the church of St. Alexander in Ofterschwang, follow the small street on the opposite side "Moosweg" towards the south to the end (approx. 200m). From here the cross-country ski course starts around the small forest. 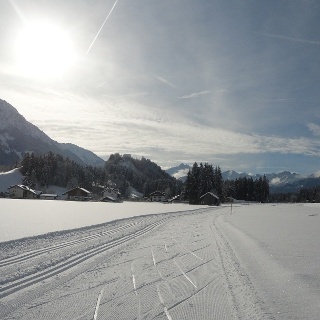 In case of sufficient snow, there is also a connection to the Sonnenalp course towards Muderbolz. 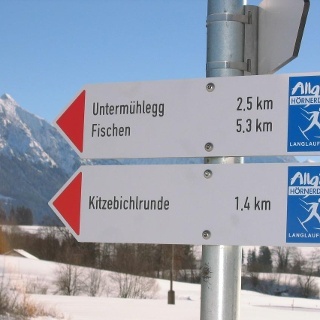 The Landhotel Alphorn also offers direct access to the course. By train to Sonthofen train station, from here take the Ofterschwang-Bolsterlang bus route to Ofterschwang. Walk about 100m up to the church and turn right into Moosweg, which leads you to the end (about 200m) where the cross-country course starts. Via B19 direction Oberstdorf between Sonthofen and Fischen at the traffic light crossing turn right to Ofterschwang. Free parcels can be found at the valley station Weltcup-Express and in a limited number in the town center.